The wide product version of the ACCUFAST 3x13 VT - UV is a full 24 inches wide with a 25% boost in curing power over double the curing area. 6 inch curing swath with rotating cure head to concentrate energy as needed. 24 inch wide paper path, adjustable height deck. Variable Speed to match mailing base input. Twin 330 CFM impellers for positive vacuum transport. The heavy duty transport is designed for mail shops that need high productivity long life and low maintenance. 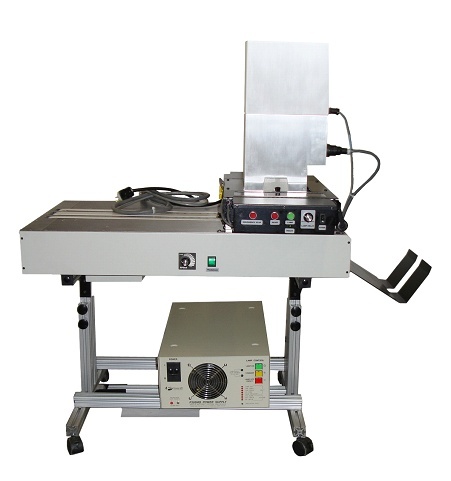 It is a roll up module that can be inserted into a mail processing line at the end of the printing base. It uses less energy than equivalent IR systems and cures UV inks to a hard, raised finished indelible print. Power: 110 VAC 60 Hz 2 amps. 240 VAC 50 Hz 1 amp. Belt Speed: Adjustable from 10-50 in/sec .